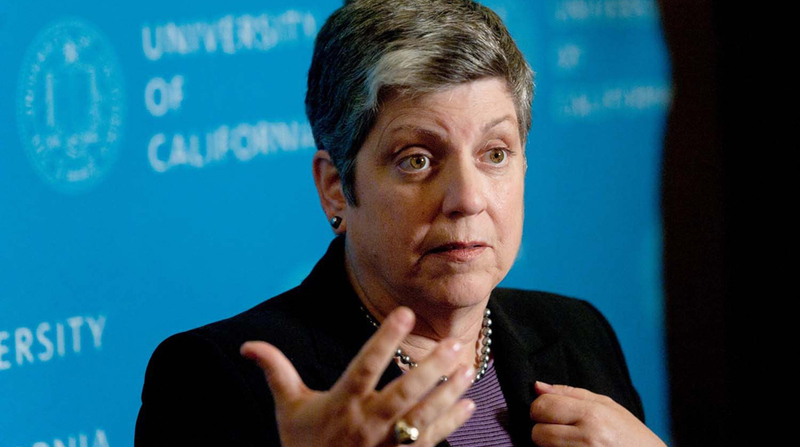 BERKELEY, Calif.—Even as one group of workers at the mammoth statewide University of California system – its 5,000 academic researchers – finally got a win against UC system President Janet Napolitano, a larger struggle involving AFSCME Local 3299 continues. And so does her adamant opposition to workers bettering themselves. Indeed, the former Obama-era Homeland Security Department Secretary has been so anti-worker that Local 3299 members took their campaign nationwide. A small group is trailing Napolitano as she tours the country promoting her new book. The result: a peaceful face-off at a progressive bookstore in D.C. on March 27. Local 3299 represents 25,000 clerical and support staffers on the system’s campuses statewide. The win came March 25 after six months of campaigning by the researchers, who unionized with Auto Workers 5810 last September. But Napolitano, also a former Democratic governor of Arizona, didn’t yield until both state and federal lawmakers put the pressure on. Then, she finally threw in the towel, and agreed to obey labor law and a National Labor Relations Board order to the UC system to recognize and bargain with the union, said Local 5810 President Anke Schennink. Key issues in the talks will be gaining university protection of foreign-born researchers against Trump administration deportations, raising current low pay, enacting job security and tenure rights and eliminating gender inequity and inconsistent promotion policies. “The university (system) did the right thing,” Schennink said after the recognition statement. He credited the researchers themselves for pushing the university into its reversal. “This decision is the result of countless hours of work from thousands of ARs who organized, spoke up, and were active in reaching out to their elected leaders. ARs look forward to working with UC to bargain a fair contract that improves working conditions for the researchers who work hard every day to make UC one of the most respected research institutions in the world,” Schennink said. But if Napolitano finally came to her senses in recognizing Local 5810, that’s not what she’s done for at least two years with workers represented by AFSCME Local 3299. They’ve had to stage three 1-day strikes in recent weeks, to draw public attention to their cause. Now, a delegation trailed Napolitano on her book tour, where she talks about the “security” measures she imposed while at DHS, especially at the U.S.-Mexico border. Wages, pensions and protection of UC system clerical and service workers, many of them migrants, from campus police cooperation with federal agents’ deportation raids, are key issues, workers and their spokeswoman told Chris Garlock of the Metro D.C. Central Labor Council during his “Your Rights At Work” radio call-in show on March 28. “We want everyone to feel the same and not have her (Napolitano) pick and choose which people of color to target,” the spokeswoman said during the phone interview with Garlock. “How safe are we?” she asked. “We had a case where the UC Police Department called ICE, who came and got people,” she added, referring to the Immigration and Customs Enforcement agency. That’s the agency GOP President Donald Trump has ordered to carry out raids against undocumented people within the U.S., not just at the southern border. 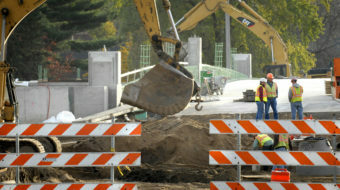 The AFSCME local is campaigning for a contract that would halt such abuses. Other issues include extensive UC system outsourcing of the workers’ jobs and growing income inequality, especially against minority-group members. “Sadly, as UC has redoubled its efforts to outsource jobs, flatten wages, and erode benefits for its employees, it has worked just as hard to silence their collective voices through intimidation tactics,” Local 3299 President Kathryn Lybarger said in mid-March. That includes an assault against one of the workers months before, leading Local 3299 to file labor law-breaking – formally called unfair labor practices – charges against Napolitano and the UC system on March 26. 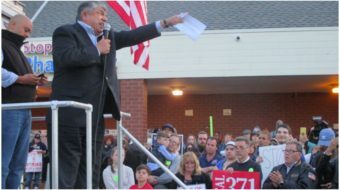 Local 3299’s struggle with Napolitano also drew the attention of the most pro-worker among 2020 presidential hopefuls, Sen. Bernie Sanders, Ind-Vt. 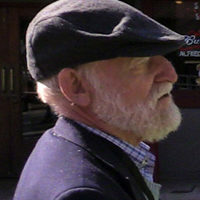 He flew to Berkeley to walk a picket line with Local 3299 workers and their allies from CWA Local 9119 on March 20. “When Bernie talks about ‘the top 1 percent,’ we’ve seen it right here at UC — more and more high-paid executives and administrators and suspect contracts with ties to the regents while workers get squeezed harder and harder and the students and patients suffer,” said Local 9119 President Jamie McDole. 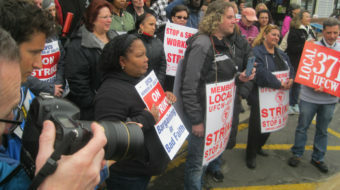 Metro DC Central Labor Council staffer and Your Rights At Work host Chris Garlock contributed material for this story.